Grocery ads are all about getting consumers to stock up on ingredients to prepare their Thanksgiving feast. As a result, potatoes are on sale and well, people love their mashed potatoes to go with their turkey dinner! But if you want to venture out and try something new this year, how about twice baked potatoes? They seem to be a little more elevated than the usual mashed potatoes. Another bonus is that you don't have to worry too much about portion control since it's naturally portioned out for you! If you want to take it a step further, you can incorporate a lot of great flavor into the mashed potato filling the potato shells are stuffed with. I went with a bit of caramelized onion and horseradish, inspired by a mashed potato recipe I noticed on Cooking Light. 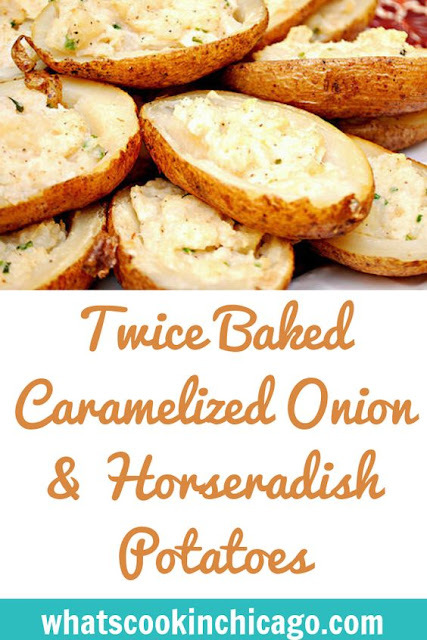 So give these Twice Baked Caramelized Onion & Horseradish Potatoes a try for Thanksgiving or any time of year! Many folks like to prep as much as they can prior to Thanksgiving day to cut down on the holiday kitchen chaos. The great news is that these twice baked potatoes can be made and prepped in advance where you can just bake the day of serving. To make ahead, prepare the recipe as directed below up until baking the filled potato shells. Once the shells have been filled, place in a disposable baking pan (for easy clean up! ), cover in plastic wrap and refrigerate. When ready to serve, simply bake as directed below in a 350 degree preheated oven and bake for 15-20 minutes, serving hot. Preheat oven to 400 degrees. Place the potatoes on a baking sheet and rub with canola oil. Sprinkle with salt and bake in preheated oven for 1 hour. Meanwhile, melt 1 tablespoon butter in a medium non-stick skillet over medium high heat. Add the onion and brown sugar to the pan and sauté until onions are caramelized, about 7-10 minutes. Remove from heat and stir in balsamic vinegar. Remove the potatoes from the oven and lower the heat to 350 degrees. Transfer onion mixture to the mixing bowl with the potatoes. Add the milk, mustard, lemon juice, horseradish, mayonnaise, green onions and salt to taste. Mash to combine. Fill the potato shells with the onion and potato mixture. 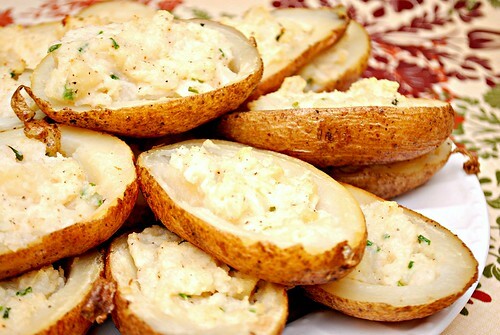 Place filled potato shells back into oven and bake for 15-20 minutes. Serve hot.